Here is a collection of baking and cooking recipes using corn as one of the ingredients. This page will be updated on regular basis. 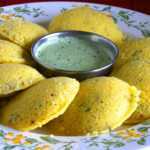 With a light yellow hue, studded with colorful vegetables, these instant cornmeal idlis will be a sure hit in your house. Serve it with hot sambar and/or coconut chutney. Kids lunch doesn't have to be just sandwiches and wraps. 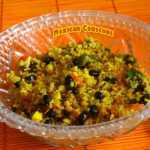 Make this vibrant, colorful Mexican couscous salad recipe and introduce them to different flavors and vegetables.